As marketing manager, Melissa creates and disseminates the Foundation’s messages to its various constituents. She helps foster greater awareness for the Foundation’s mission and services throughout the community. Melissa joined the Foundation in May 2018. 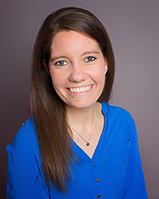 Melissa comes to the Foundation after eight years in multiple marketing roles at the Downers Grove Public Library. There she communicated library messages, organized special events, and initiated mutually-beneficial relationships with residents, businesses, organizations, and other government entities. As an integral member of the library’s management team, she participated in two successful strategic planning cycles. Melissa holds a Bachelor of Arts from Saint Xavier University where she studied communications and writing. She resides in Lemont with her husband and enjoys reading, vacationing, and doing Random Acts of Kindness.